As some evacuation orders are lifted, people are starting to return to their homes near the Mendocino Complex fires straddling Mendocino and Lake counties, but some people say life is anything but normal. Anser Hassan reports. Firefighters are still battling blazes in Northern Calif., including one that has destroyed more than 1,000 homes near Redding. That fire alone has forced 38,000 people from their homes and killed six. Officials said it is 35 percent contained. Just a month into the budget year, California has already spent one quarter of its annual fire budget. A massive wildfire in Northern California has torched more than 1,000 homes in and around the city of Redding, authorities said Wednesday as some evacuees were allowed to return home and new blazes exploded in what has become an endless summer of flame in the Golden State. "Whatever resources are needed, we're putting them there," Gov. Jerry Brown said at a news conference. "We're being surprised. Every year is teaching the fire authorities new lessons. We're in uncharted territory." 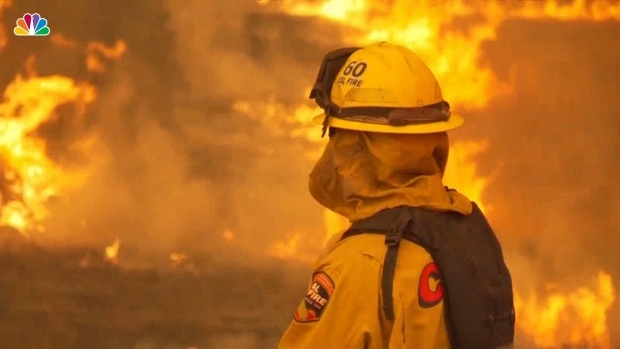 Just a month into the budget year, the state has already spent more than one-quarter of its annual fire budget, at least $125 million, California Department of Forestry and Fire Protection spokesman Mike Mohler said. Cal Fire said another 488 buildings, including barns and warehouses, have also been destroyed by the fire, which is now the sixth most destructive in California history. 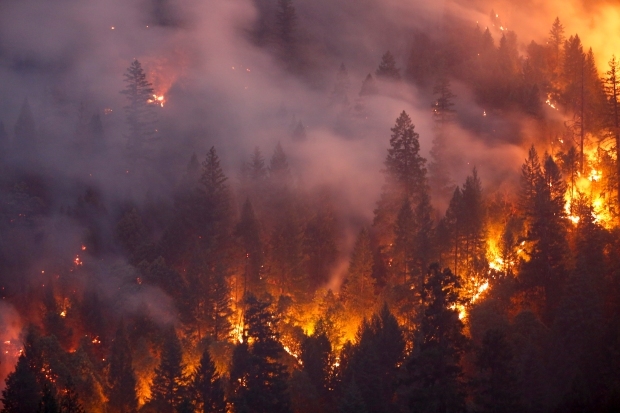 The 121,000-acre Redding-area blaze, which started July 23, forced 38,000 people from their homes and killed six. 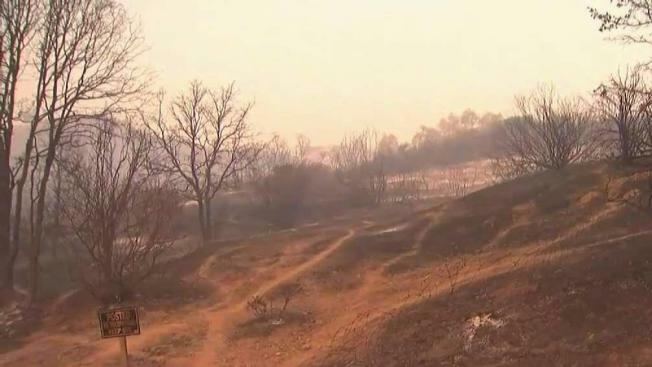 It has scorched 189 square miles (490 square kilometers) and is 35 percent contained. At least three new fires erupted Wednesday in the Sierra Nevada region, including a blaze in Placer County that had consumed 1 1/2 square miles (1,000 acres or 4 square kilometers) of land. North of San Francisco, a fire threatened homes in an old ranching and farming area near Covelo. About 60 homes were ordered evacuated as the blaze erupted late Tuesday and winds whipped flames through brush, grass, oak, pine and fir near the Mendocino National Forest, officials said. To the east, another blaze Tuesday night raged through grassy cattle lands near Yuba City, covering more than 1 1/2 square miles (4 square kilometers) in a few hours. The new fires erupted without warning and spread with shocking speed through forest and brush that have literally become tinder, said Scott McLean of CalFire. "It just goes on and on," McLean said. "We had this rain at the beginning of the year and all that did was promote the growing of grass and brush," McLean said. "It's a Catch-22. It's growing more product to catch on fire." He said the state really never left its drought status and several years of significant rainfall are needed to bring the state back. McLean also had a warning for people visiting rural and wilderness areas. "Pay attention," he said. "Don't park the car on dry grass ... no campfires, no flame. It doesn't take anything to start a fire right now." The new fire near Covelo was only about 40 miles (64 kilometers) north of where twin fires in Mendocino and Lake counties have burned an area three times the size of San Francisco, destroyed 14 homes and threatened 12,000 more. The Lake County seat of Lakeport remained under evacuation orders and was a virtual ghost town, although people were allowed back home in several smaller communities as firefighters shored up containment lines. Containment grew overnight to 24 percent. Jessyca Lytle fled a fast-moving wildfire in 2015 that spared her property but destroyed her mother's memorabilia-filled Lake County home. Lytle found herself listening to scanner traffic Tuesday and fire-proofing her mother's new home as another wildfire advanced. Firefighters are battling at least 17 wildfires across California. "Honestly, what I'm thinking right now is I just want this to end," Lytle said, adding that she was "exhausted in every way possible — physically, emotionally, all of that." "I told them to throw everything they care about in the back of the car," said Lew, 45. "I grabbed computers, cellphones, papers. I just started bagging all my paperwork up, clothes, my guitars." "It's like three a year," he said. "It's kind of crazy." In Shasta County's Carr Fire, authorities said Wednesday all those reported missing had been located. A relative identified the latest known fatal victim as Daniel Bush, 62. A 2-year-old girl decided to lend a hand to firefighters in Northern California. Bush had returned to his mobile home in the community of Keswick last Tuesday after undergoing quadruple heart bypass surgery, but he was unable to drive and would have needed help to evacuate when the fire came through the neighborhood on Thursday, his sister, Kathi Gaston, told the Record Searchlight newspaper of Redding. Gaston said her brother had wanted to stay in his own home, but he had spotty cell service and, with the power out, he might not have gotten word of the fire. Gaston said she could not get to her brother's house because, with the fire approaching, sheriff's deputies had blocked the roads and then she herself had to evacuate. "If we'd been able to go in when we wanted to, he'd be alive right now," she said. "I'm very upset about it." National Park Service officials said Tuesday that the scenic Yosemite Valley and other areas will be closed at least through Sunday due to heavy smoke from the so-called Ferguson Fire. The closure began July 25. It was the longest closure at Yosemite since 1997, when floods closed the park for over two months. Authorities on Wednesday also ordered the evacuation of the tiny community of Wawona, south of the park, which has fewer than 200 residents. Associated Press writer Olga R. Rodriguez contributed to this report.